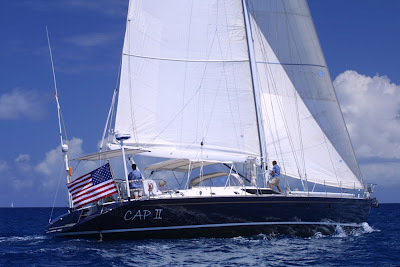 Cap II is a beautiful 76-foot CNB Bordeaux 76 sloop with a crew of two. Cap II is fully air conditioned and accommodates up to eight guests in four equivalent double cabins, each with ensuite heads/showers. The two forward cabins can be combined into one large cabin. The center cockpit is dedicated to the guests' enjoyment as the steering and sail handling is carried out from the aft cockpit. Using a sharp bread knife, make a pocket in each slice of bread. Place a small slice of cream cheese inside. Add orange marmalade to the pocket. 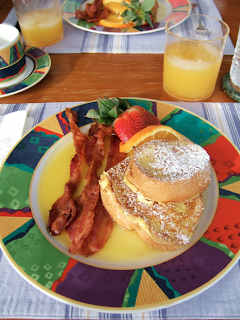 Beat together the eggs, cream, Grand Marnier, orange juice and nutmeg. Pour egg mixture over the bread, and let stand 5 minutes. Fry each slice in butter until golden brown. Remove to a cookie sheet and place in a warm oven (350 degrees). The toast will puff up and finish cooking through in the oven. For the orange butter syrup, melt all ingredients together in a small saucepan. To serve: Spoon syrup on the plates, add 2 slices french toast and sprinkle with powdered sugar. Garnish with fresh oranges or mint. McGregor is a 58-foot Hatteras motor yacht with a owner-operator crew of two, Tim and Julie. McGregor is air conditioned and can accommodate up to 6 guests in 3 cabins, all each having their own private head/shower. The master cabin, aft, has a Queen bed, desk, TV/DVD. The middle cabin has two single beds that can be converted into a queen, with its bathroom across the hallway. The forward cabin is ideal for children with its bunk beds, TV/DVD, and ensuite head/shower. McGregor has a 15-foot center console dinghy with 70HP motor, waterskis, kneeboard, wakeboard, tube, two kayaks, standup paddleboard (SUP) snorkel gear, fishing gear, TV/DVD in the salon, underwater camera, etc... Lots of toys including a squirtgun arsenal. Tim is a diving instructor and 7 dives/week for certified divers are included in his rates, plus two FREE resort/discover scuba course are included for non-certified divers who want to try out scuba. A referral course to complete the dive portion of your PADI Open Water Diver certification is also free. Let's start planning your McGregor yachting vacation today.